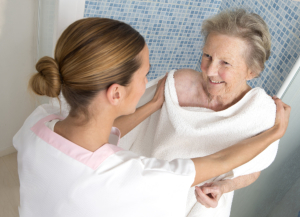 With the help of our caregivers, precautionary measures are maintained to ensure seniors’ safety when bathing. Bathrooms are one of the most utilized zones by seniors in the home. Aside from the daily showers, these are most likely used for personal or hygienic purposes. But don’t you know that this can be one of the dangerous parts of your home? This is especially true for seniors with physical-limiting conditions. Areas inside the bathroom can be wet and slippery at times which are one of the leading causes of slips and fall-related accidents. To avoid such cases like these, our caregivers provide hands-on supervision and assistance with seniors’ bathing needs while respecting their independence and privacy. For inquiries, call us now at 586-920-2465.